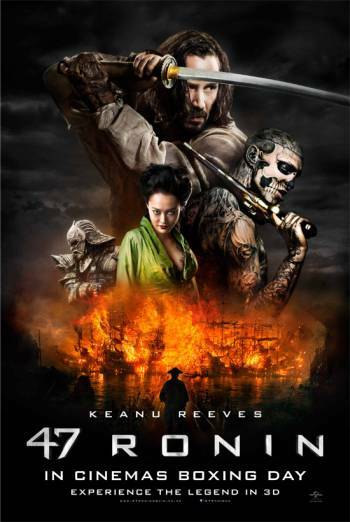 47 RONIN is a fantasy action adventure, set in Shogunate Japan, in which a group of former samurai warriors and a slave set out to avenge the death of their master. There are several sword fights and a couple of large-scale battles, but little blood or injury detail. Two scenes include the brief holding aloft of severed heads. In two other scenes it is implied that one or more characters take their own lives by ritual suicide. In a fantasy sequence, the principal villain lies on top of a struggling woman. The scene briefly and discreetly implies sexual assault.